Watching movies online has become an integral part of our life, especially free movies online. We have become more dependent on the digital contents published worldwide of which movies have played a big factor. GoMovies which is a great movie streaming site has now become unavailable for users and this can be a nightmare for them because hunting for latest movies might sound to be a tedious task for everyone. Tips: Though the Christmas holiday were over, you may now want to relive the holiday season. Then why not stream your favourite Christmas Movies here? So, to save your precious time, we have listed out the best 8 free movie streaming sites conducting as alternatives to GoMovies website. This will help you readily watch movies online for free even the new ones and you can also download these movies for later watching as well. Meanwhile, if you also like Solarmovie website and want to find some alternative sites for it, you can get to know the top 10 alternatives to Solarmovie for you to watch free movies. Tip: You can turn to Gihosoft Free Video Converter to help you convert the format of downloaded movies or TV series because you may encounter incompatible issues when you need to play them on different devices. This video converter empowers you to convert videos to MP4, AVI, MKV, MOV and more at a blazing fast speed, so you can easily change video formats. And it can not only convert HD video files but also download single video, playlist, channel & subtitle from YouTube. This free movie streaming site is the ultimate place where you can watch movies as well as TV shows absolutely without any subscription fee. 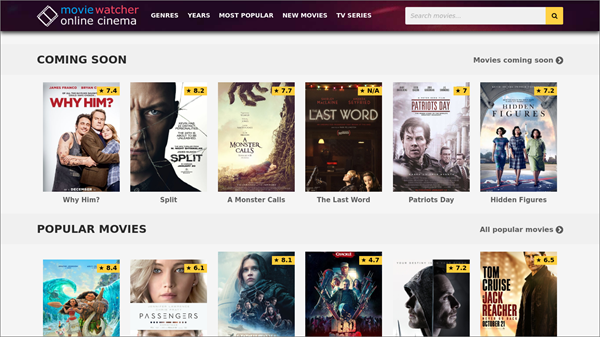 MovieWatcher has more than 90% of its movies published on this site through third-party links of streaming players. Talking about their slogan, “Watch a movie for free: We are legal”, you need to know when you are visiting any site for watching movies, they should not ask for your any personal information. If so, please remember not to put any personal information like credit card information to avoid unnecessary charges. Vidics is a genuine alternative to GoMovies website which can be considered for watching movies online for free. Not only does this site give you unlimited access to movies but also lets you watch movies from all over the globe. You can search from different categories by using the tabs on the top. One of the biggest noticeable tabs of this site is the “Schedule” tab which provides you with a list of movies and TV shows that get updated per day. Moreover, each movie has a short description of what it is about and the reviews of the actors’ performance in the movie. However, the only disadvantage of Vidics is that not all of the videos have been translated into various types of language. This website seems to get continuous improvements to the service they provide to a huge amount of viewers out here. Everyday new free movie streaming sites are getting established just like Viooz. 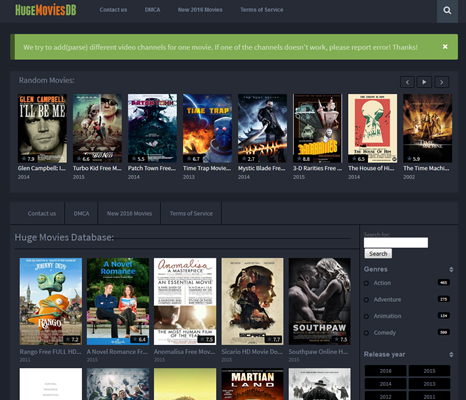 It borrows similar interface as that of YesMovies. Being very interactive and user-friendly, the website always updates itself with every new movie launching. If you are quite familiar with the other sites mentioned above, then it will be similar for you to browse Viooz. The site shows too much annoying pop-up ads while you are watching movies, and almost 10 ads will surely show up on every new tab before the movie gets actually loaded. And you’ll face the same problem while downloading movies as well. Viooz’s web contents and appearance constantly get updated along with new homepage appearance every now and then. Recent changes have made it look more appealing and much more organized. 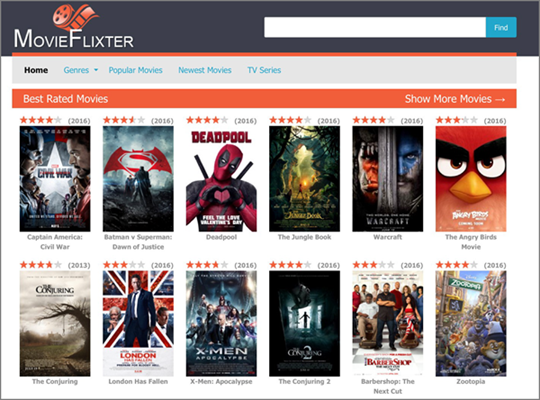 MovieFlixter is another less frequently known free movie streaming site that has latest and a wide range of movies available in HD resolution for the best viewing experience. You can watch movies online for free without any limit. Like MovieWatcher, this site also indexes from other movie sites and directly provides you with links to access their servers as well. You just need to decide which movie you want to watch and simply click on the movie picture and then it will automatically get started. To get a better movie watching experience you need to register an account on this site. Though you may wonder why you need to register, whenever you want to play your favorite movies it will continuously ask you for registration and disturb you by continuously showing pop-up ads while you are watching a movie on the website. As its name suggests, HugeMoviesdb does have a huge library of movies for you to watch. Although this free movie streaming site does not seem much popular, but it provides you with unlimited access to different genres of movies, especially old movies. Also, the navigation of HugeMoviesdb might be a bit different from the aforementioned sites. The site contains tags by category, or you can use the mouse to scroll down the homepage. Continuously scroll down the homepage and you will see more contents unless you reach the end of the movie list. The site is constantly being developed and updated, and new web pages have been created to expand the variety and make it easier for users to navigate. You can either click on “Visit our new site” button that resides on the home page of the old site or you can just click on the hyperlink given below to visit the new domain of the site. Notice that the name of this site has also changed, but it retains the same physical appearance that was seen before. Oakmovies is another website for you to watch movies online for free which borrows lots of similarities from the GoMovies. Though it might sound quite unfamiliar for you, this website has got all the most recent movies that have been shown in the cinema recently and a huge library of old movies as well. The site is as direct as its predecessor. Just click on the number to get a list of more movies, and then just scroll down to select the movie you want to watch. This site is very simple and clean, so you can watch movies without too many instructions to follow through this website. 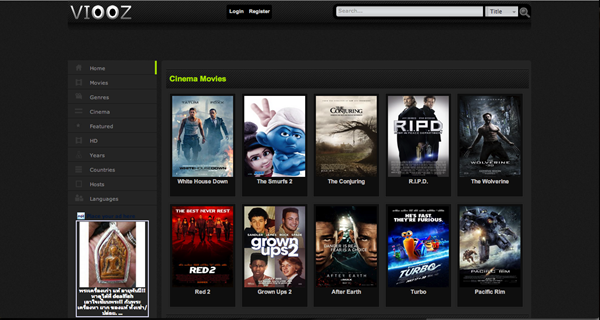 This is one of the most interactive free web service that focuses to rpovide you with the latest movies. After visiting you’ll notice movies flashing including the description of the movie. Apart from watching the movies, hover your mouse to the movie you want to see and you will get all information including the video quality. Another positive thing about the site is that its updated frequently. You can even directly share the video to anyone in the social media as the site lets you do so by giving a direct link to share to different social networking sites. To watch the full list of wide range of movies visit the official page. As the name suggests, this might not be the best place to satisfy yourself with bulks of movies. Even visiting this site for the first time will make you feel this to be a dull site, but its simplicity makes it better and faster. This is a very straightforward kind of site. Firstly on the front page you’ll notice two categories: “Movies” and “TVshows”. If you want to watch movies click on movie to see the complete list of movies that are available. Also there is a wide quantity of movie shows available on the site but, this site’s player gives might wait you longer as sometimes it automatically gets loaded if you just click on the player to show up several annoying pop-up ads. So better to be patient as consumes few seconds to load. The best 8 free movie streaming sites which serve as alternatives to GoMovies website have been roughly introduced for you. So, you can try each of them out and find one of your taste to readily watch all your favorite movies anytime you want. You can also recommend some good sites like GoMovies you prefer in comment area below. And you can use an ad blocker on these sites so that you might not get into trouble with annoying ads while watching movies online.